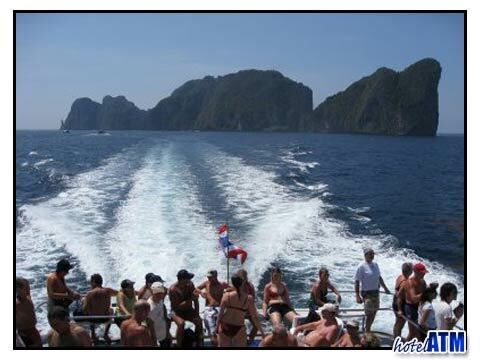 The Phi Phi Patong ferry takes you from one of Thailand's most scenic islands, Phi Phi to one of the countries most popular and lively travel destinations, Patong Beach. The ferry and bus or taxi ride takes you just over 2 hours. The Phi Phi Patong ferry starts at the comfortable Phi Phi Don Village Pier. Boarding the ferry used to be a great problem before the government built a smart and efficient pier that makes travel so much better. The ferry heads out of Tonsai Bay under the towering cliffs of Phi Phi Don and as you you turn west towards Phuket you get one last close view of Phi Phi Ley. Phi Phi Ley is where they shot the movie 'The Beach' with Leonardo Di Caprio on Maya Bay. As the Phi Phi Patong ferry heads out into the Andaman sea the cruise takes in the islands of Koh Doc Mai, Koh Yao and the mountainous Phuket Island. The morning ferry has the sun on your back whereas the afternoon sailing approaches Phuket as the sun is starting to loose it's heat and set. As you get close to Phuket you get a glimpse of the famous Phang Nga Bay, a sea studded with islands and where they shot the movie 'The Man with the Golden Gun'. The Phi Phi Patong ferry arrives at Rasada Pier just outside Phuket Town. Here you are transferred to bus or taxi depending on your preference. The transfer to Patong passes through Phuket town and Kathu village on the east side of the Pass over the Patong Highlands. The Thanon Phrabarami Pass on route 4029 is a twisty and steep road in parts but takes you through some delightful rubber tree plantations and natural jungle scenery. At the top of the pass is The Temple on Patong Hill (Pun Tuao Kong Chinese Shrine) where drivers beep their horn to remind the Gods to look after them on their descent. The Phi Phi Patong ferries go at 09.00 am in the morning and there are places on Phi Phi down by the pier to grab a 'run and go' coffee before you get on the boat. 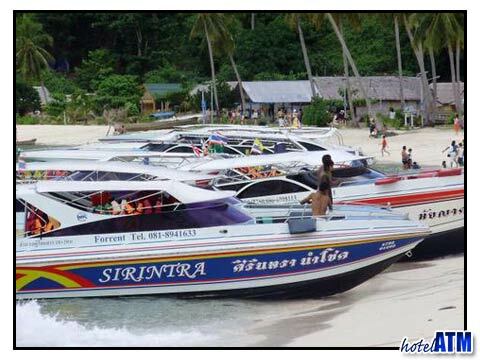 The 09.00 ferries are used by the Phi Phi people, who need to get to market for the day and return on the afternoon ferry Phuket to Phi Phi. The 14.00 pm and 14.30 pm ferries are larger than the morning ferries but can be busier with one day sightseers from Phuket. The best link to get the Phi Phi Patong ferry timetable is on the Phi Phi Patong ferry page and aim for the 'return only from Phi Phi' buttons. The Phi Phi Patong ferry schedule is straight forward. The ferries run every day throughout the year. The only time when they are not running is if there is a Marine Police warning of a bad storm approaching. This might happen in the monsoon months of June and September but as the ferries have become larger these warnings have become less and less. The Patong hotels offer a wide selection of accommodation. The resorts and hotels of note are the beachfront Holiday Inn Resort Phuket, Phuket Graceland Resort And Spa and La Flora Resort Patong. These 4 and 5 star resort bring you the best of what Patong has to offer as well as some delightful sunsets over the Indian Ocean. The Duangjitt Resort offers great value 4 star accommodation 150 meters back from the beach. The Baan Yin Dee is a 4 star resort overlooking Patong but only 5 minutes from the centre of town. The Millennium Resort Patong Phuket and Thara Patong Beach Resort And Spa offer luxury accommodation in the heart of the exotic nightlife district of Bangla Road. Cheap hotels in Patong is a great article to get you started on budget and mid-range accommodation. It also points out where to find the best deals and what months are the best time to get a good price compared to the seasons.